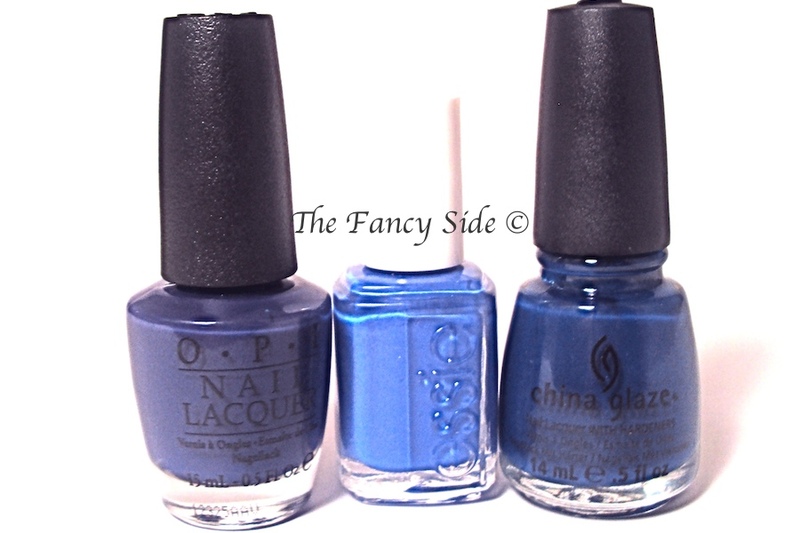 Recently I bought OPI's Eurso Euro from their Euro Centrale Collection. My friend Valerie has this color and I was super jealous because it looked gorgeous on her. So when I stumbled upon a buy 1 get 2 free sale at a Walmart Salon, this pretty was one that I brought home. And on the way home, I got to thinking. This is the following conversation I had with myself. "How close is this to China Glaze's Man Hunt?" and "Oh goodness, what about Essie Butler Please?" and finally "Shiznit, I bought the same color that I already have." So naturally, I had to compare them all. Here they are. 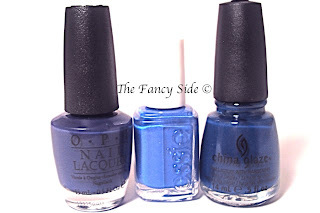 From left to right you have OPI Eurso Euro, Essie Butler Please, and China Glaze Man Hunt. As you can see 2 out of the 3 colors that I was thinking about are incredibly similar. 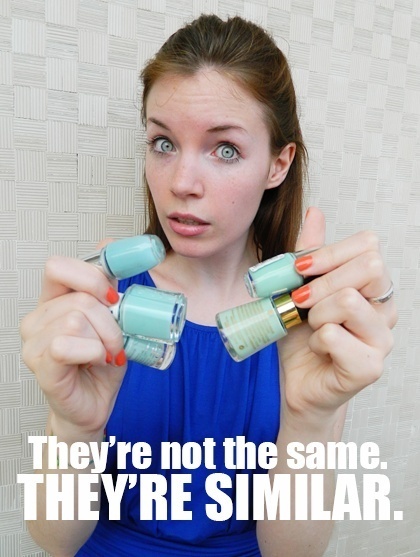 I have individual swatches of each polish and then a comparison swatch. Yay. Be excited. I know you are. I can tell. First up you'll see OPI's Eurso Euro. 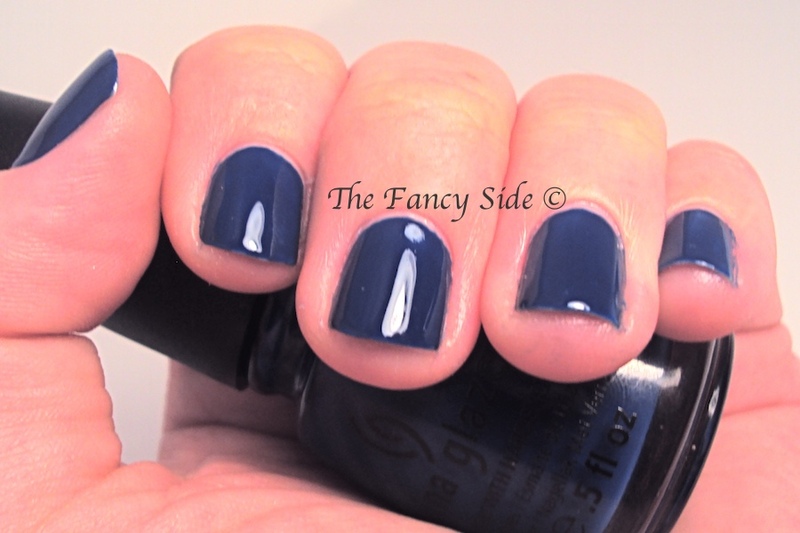 This is a great dark royal blue. 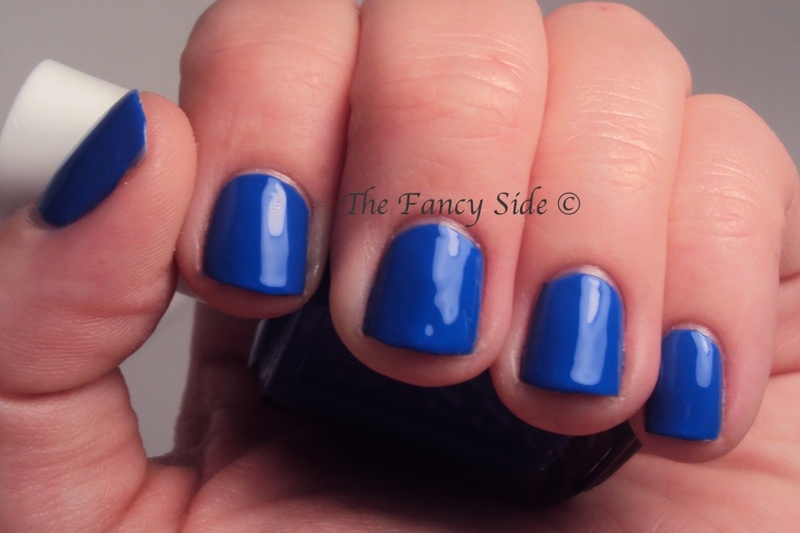 It comes from OPI's Euro Centrale collection. It applies like a dream and you are looking at 2 thin coats. I love this blue. This is Essie's Butler Please. This is two thin coats and it applies like buttah. This is a brighter blue that I adore. Its so bright and yummy in real life. Is it weird to say that I love this blue too? Because I do. Finally, this is China Glaze's Man Hunt. Man Hunt is a more dusty deeper blue and I love it too. This color also applies easily and you are looking at two thin coats here as well. Lets look at them all next to each other. As you can see they are similar but not the same. 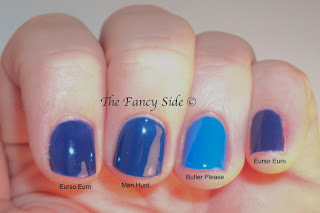 Eurso Euro is more on the Royal Blue Side, Man Hunt is more of a medium dusty blue leaning toward the navy ends, Butler Please is definitely not comparable, its a lot brighter than the other too. Do you need both Eurso Euro and Man Hunt, probably not. Do I need them both? YES!